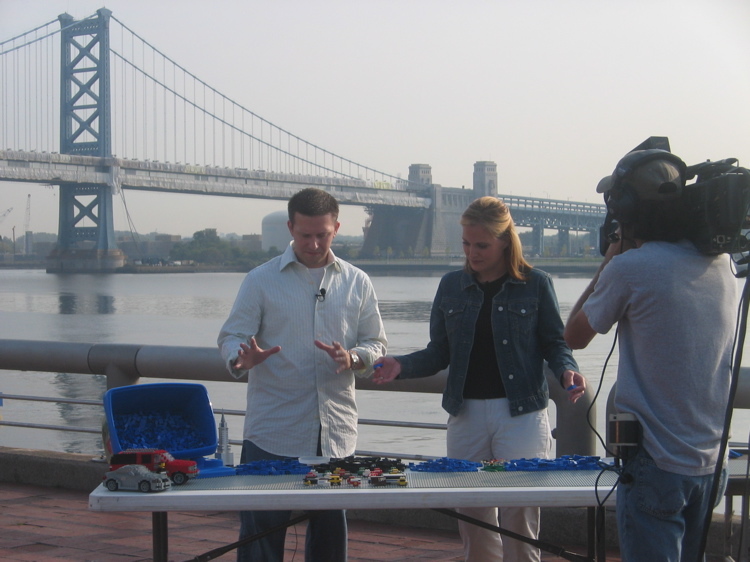 In July 2004, I was contacted by Nicole Fox, one of the hosts of "Your Morning on CN8", a live morning show that reaches 6.2 million homes in the Northeastern U.S. She thought it would be fun to feature me on her show. Since the show is based out of Philadelphia, we decided it would be fun to build a local "Philly" model. 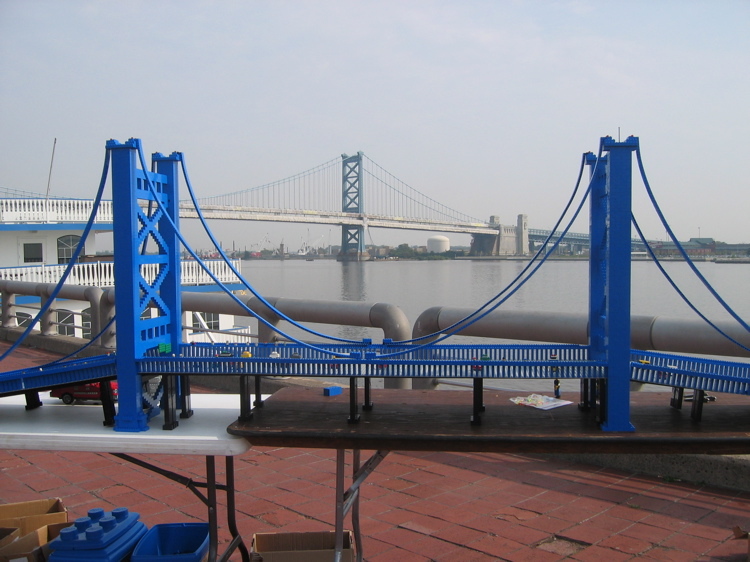 And since I am passionate about architecture, we decided to build a model of the Ben Franklin Bridge, at Penns Landing underneath the actual bridge. The show aired on Monday September 27, 2004, between 9 am and 11 am. We arrived around 7:30 am to set up. 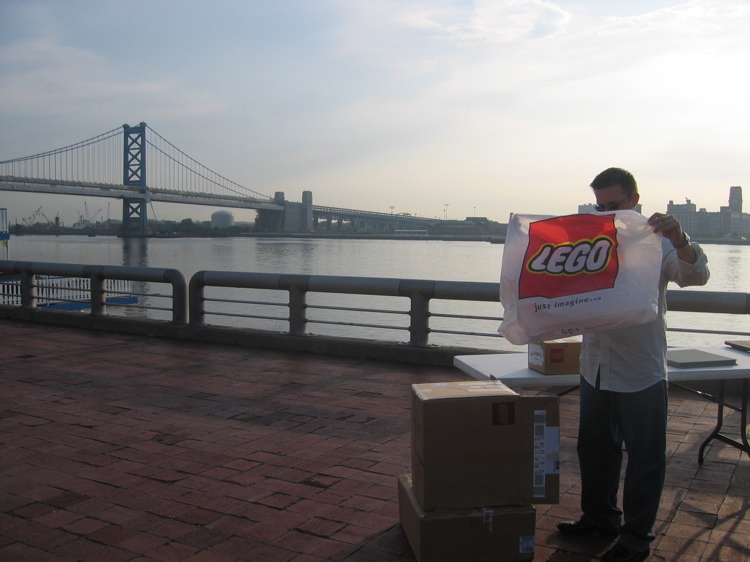 I had flown out with about 10,000 loose LEGO pieces as luggage, and the folks at Penns Landing supplied some long tables for me to build on. 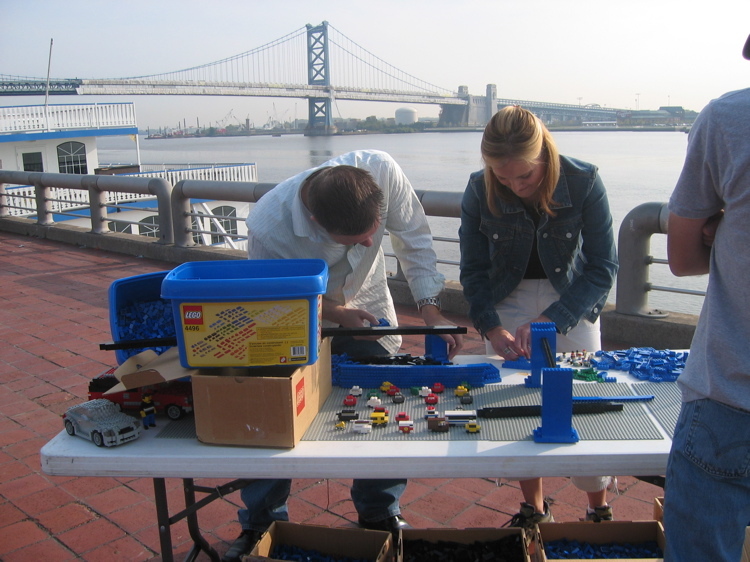 Situated at the base of the bridge, I spread out my LEGO pieces and prepared for a crazy morning of building. ... and then we started building! Nicole started by piecing together four of the 4-foot-long suspension cables, and I worked on the main stanchions. We cut away after a few minutes and continued building off-camera while other features ran on the show. In order to get the bridge done in time, my fiancee Lily and I pre-built some small 4-piece and 8-piece stacks of bricks. It's a good thing we did, because we ended up finishing just in time! 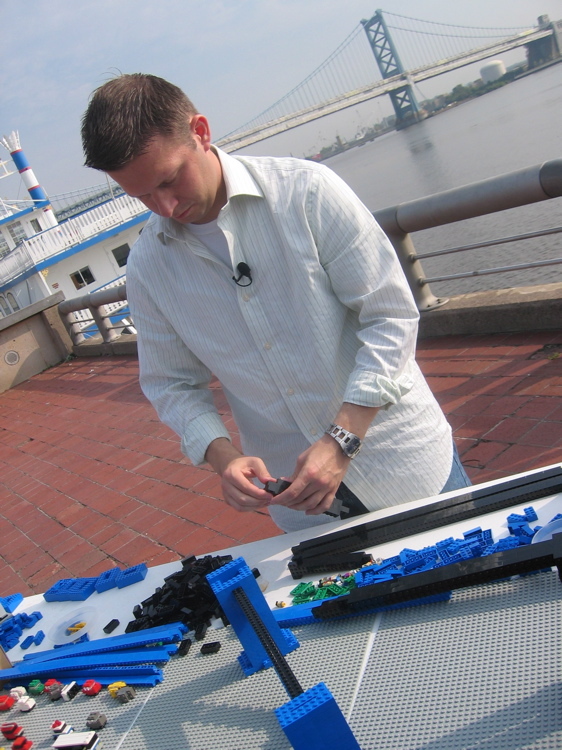 I spent 2 days before the show researching the architecture of the bridge, building prototypes, and aquiring LEGO elements. Nicole and our photogrpaher, Shannon, both thouroughly enjoyed the hours of building. Coming along nicely... I've almost finished the second stanchion, and Nicole is adding some of the stacks of 1x2 bricks. 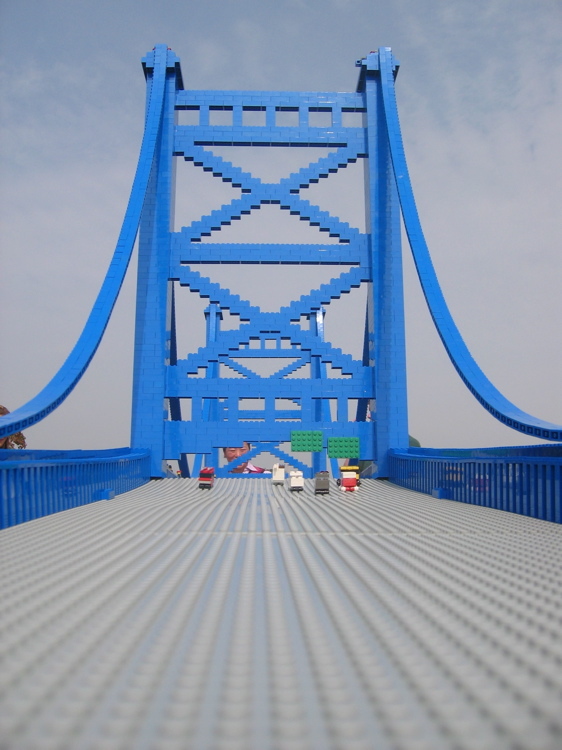 Each of the large grey baseplate was lined with 200 1x2 bricks, totalling 2000 for the entire bridge. Nicole finished up the suspension cables, which were made by lining up hundreds of 1x2 bricks. I showed her how they act like little hinges and "flex". By our second-to-last live hit, you can see that much of the bridge is done. Over half of it is already raised onto the superstructure, which was just a simple, loosly balanced grid of "beams" built out of 2x4 bricks. I was very fortunate that it was not windy, because the model relied on a lot of simple balancing! Here I am putting some final details on the top of one of the stanchions. We'd already attached the suspension cables at this point, and I thought it would be fun to add some airplane lights and radio antennaes. 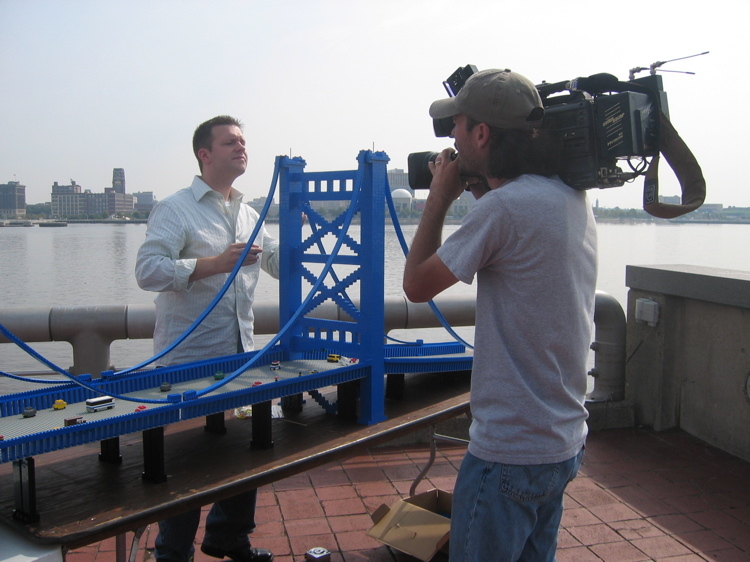 This close-up footage of me building was later run on the CN8 daily news. OK, some background -- my fiancee Lily and my friend Steve both came to help out during the show. Nicole was chatting with Steve off camera when he mentioned that he just recieved a LEGO "Save the date" wedding postcard from Lily and I. The cards featured 1:20 scale LEGO models of myself and of Lily. 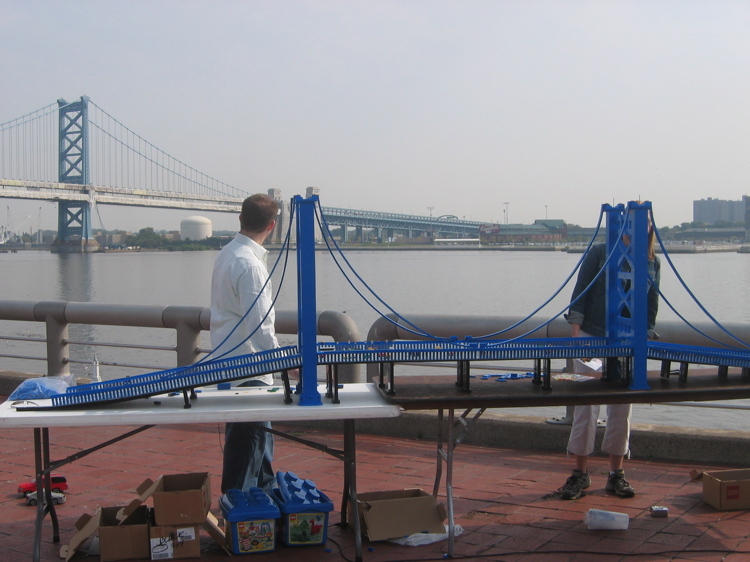 Here we are, with the completed bridge, looking back onto the real Ben Franklin Bridge. My main goal on this project was to get a reasonable recognizable impression of the bridge, rather than a literal duplication. 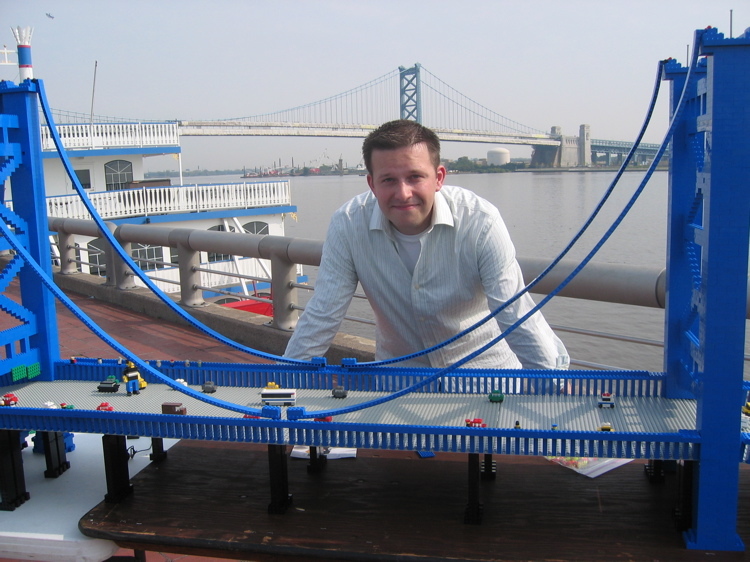 My model is, of course, not to scale -- at the height we made it, it would have been over 50 feet long. You'll also notice that I only reproduced two of the three "X" shapes in the main stanchions. After the show ended, Nicole and I posed for a picture with the bridge. Final piece count was about 7000 pieces (estimtated). It was about 3 feet tall and 12.5 feet long. 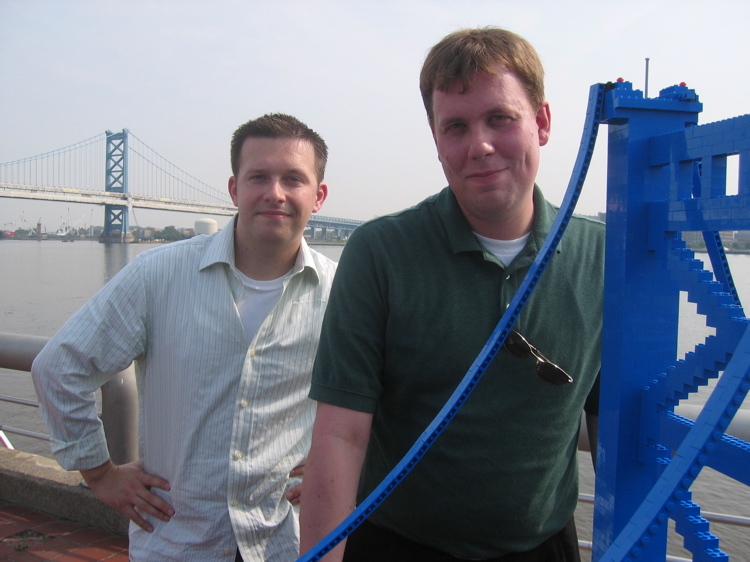 Steve (right) is a friend of mine from grade school who happened to recently start working in Philly. He came by and helped build a lot of the roadway areas off-camera ... and it's a good thing too! Nicole, my fiancee Lily, and I would have never finished in time otherwise! 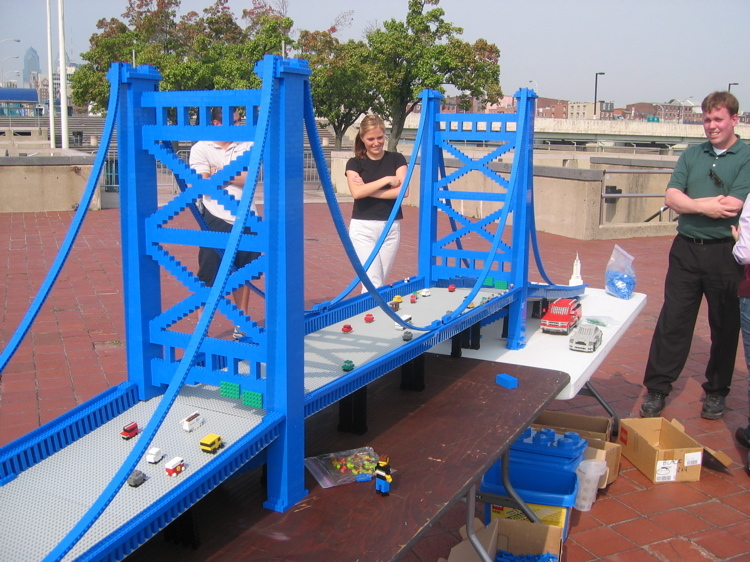 Here's a picture of the real bridge and the model. If I had more time, I would have liked to have built more cars and added roadway lanes and a concrete divider down the center. 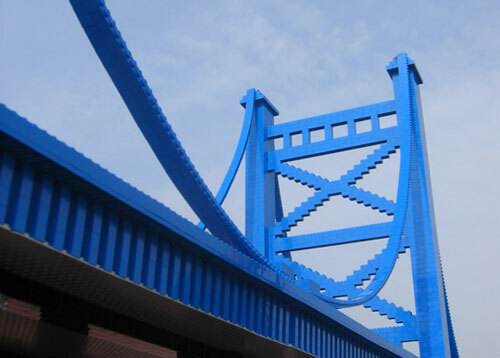 The real Ben Franklin Bridge also has a set of train tracks running on the outer edges, but it didn't seem feasable to add them in with the amount of time we had. Here is one last picture of the model before we dismantled it. We kept most of it in large "chunks" so that I could reassemble it when I got home... but on our way out of Philadelphia, we were rear-ended in our rental car and the model (which was in the trunk) was completely destroyed. (We were OK, it was only a fender-bender, but it wasn't anything an unglued LEGO model could have survived!) I guess it will only live in our memories from now on. All in all, I had a wonderful time working with Nicole and Shannon from CN8. 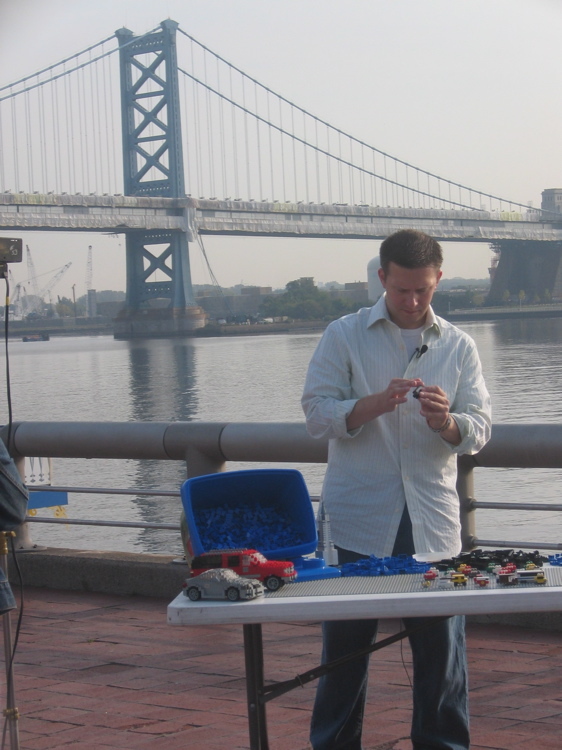 We all had a great time, the folks from Penns Landing were really nice to us (and even stayed to watch most of the building!) I was really concerned that we wouldn't be able to "pull it off", but everything went according to plan! I hope to get a video copy of the show (I haven't even seen it yet) so maybe I can post some video clips at some point in the near future.